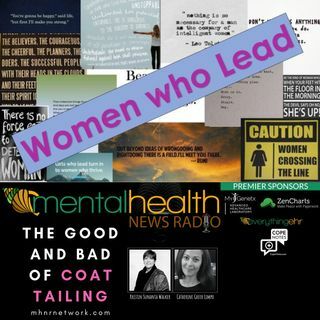 Join Kristin Sunanta Walker and Catherine Greer Limpo on their new series on Mental Health News Radio about female leadership. This week they discuss the good and bad aspects of coat tailing. Does it have good aspects? Women who lead explores the dynamics of women in leadership positions from CEOs to Senior Management to Directors to Agents of Social Change. We'll be interviewing women from all walks of life for a very ... See More different take on what it means to be a driven, ambitious, compassionate - yet authentic leader.